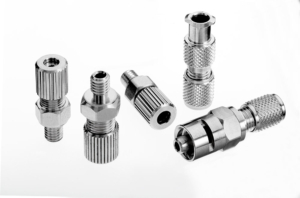 MicroGroup compression fittings allow quick, easy connection to a wide variety of materials and tube diameters. These handy components eliminate the need for time consuming and costly secondary operations including welding, brazing, soldering and more. Primarily stocked as 316 stainless steel compression fittings with reusable and replaceable silicone seals, custom materials are available upon request. Also see Specialty Saw for cutting of small diameter tubing.